It may be debatable if Indianapolis, IN is developing in the US doom capital with The Gates of Slumber emerging as a flagship, but it is beyond any doubt that Eyes Like Snow recently delivered a powerful one-two doom punch with The Wandering Midget and now Indy natives Apostle of Solitude. Guitarist/vocalist Chuck Brown actually departed the drum stool of The Gates of Slumber to concentrate on guitar and his own band, delivering no less devastating traditional doom. Playing off the title, I have heard more miserable records than Sincerest Misery, but the album certainly does not lack sincerity, thoughtful waves of warm analog recorded classic doom inspired by Candlemass and Solitude Aeternus washing over the listener. After a run through possibilities which is The Messenger (Trouble-like Christian lyrics here? ), Apostle of Solitude captivates with the crushing riff of Confess, adding little offshoot leads, firmly establishing that the band will be defined by the strength of its guitars, just like so many distinguished doom acts before them. 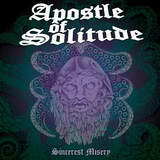 Apostle of Solitude do not shy away from more classic heavy metal influences in their music, the leads often borrowing from neo-classical instead of blues, Last Tears totally hitting my weak sweet spot with its 1-2-3 waltz chords. This is not to say that the band can’t hit a decelerator and deliver a slow and painful A Slow Suicide or describe an ultimate war machine in dragging Warbird, which also has an involved solo work and culminates in outright lament by the survivors of the nuclear fallout. Chuck Brown’s voice does not have the range of Messiah Marcolin or Robert Lowe, but it gets the job done, trembling tension in his voice, no straining, especially given that Apostle of Solitude speak more so with their music, longing desperate reflective instrumental The Dark Tower not to be overlooked. Seamless two guitar interplay, one sounding as if it was a cello, in the epic title track is another example of Sincerest Misery leaving the mark. Electric Funeral cover (Black Sabbath) shows the band paying due homage to the genre masters, while bringing out a totally new, their own, rendition of the middle section. Just about the only track which did not connect with me was This Dustbowl Earth with vocals coming as if from the room nextdoor, preachy, televangelist quality, but totally illegible, compounding the problem of those mighty guitars being now jangly and detuned. Returning from the recent business trip I was driving home with a metal novice, a guy who is just trying to grasp the breadth of what metal has to offer. I played Confess to him, as Apostle of Solitude was my companion for a few weeks now, and after his comments that “this style I haven’t heard before”, I explained to him what true doom metal means – a crushing steamroller from which there is no escape, so it’d be best to sort out your emotions and soldier on, carrying the weight of life on your shoulders, unless succumbing to the circumstances is what is inevitable at this given moment.